In its third phase of initiative against inner-line permit (ILP) defaulters and influx of illegal immigrants into Nagaland, the Naga Students Federation (NSF) on Friday organised a public rally here to demand inclusion of Dimapur district under the purview of ILP. 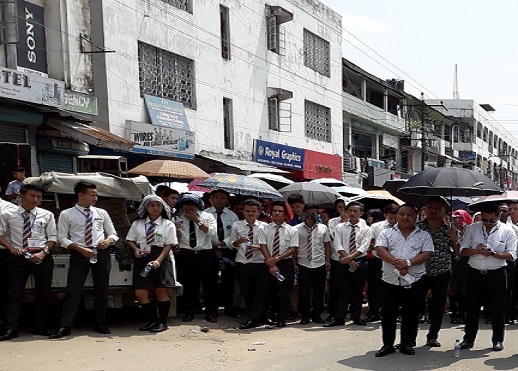 On August 24, the NSF, along with its federating units, organised a similar rally, as its second phase of initiative, in Kohima to protest against influx of illegal immigrants into the state and also to demand inclusion of Dimapur district under ILP system. In the first phase, the NSF, along with the Angami Students Union, jointly conducted massive verification of ILP in Kohima on August 8. The rally here on Friday failed to draw a big gathering even as countable number of students and members of public, braving the scorching heat, attended it. According to Christopher, there are middlemen at work to get ILPs for the outsiders. He asked the students to be watchdog of these middlemen to curb the menace of illegal immigrants. Observing that the people with questionable identities are indulging in the anti-social activities in Dimapur, Christopher wanted that all underground groups in Nagaland issue strict order to their rank and file not to use the services of the illegal immigrants. “If our economy is controlled by others, our future will also be controlled by them,” he cautioned. “Let’s toil and work hard,” he stressed. The Nagaland government had set up a committee headed by commissioner and secretary to the chief minister, Abhishek Singh, to prepare a comprehensive action plan and mechanisms to streamline ILP and to effectively curb illegal immigrants and also to bring out a strong policy to safeguard the rights and security of indigenous inhabitants of the state as a consequence of the ongoing NRC drive in Assam.